We men don’t get enough time to ourselves. In these modern times we have to consider the wishes of our equal opposites and spend a fair bit of our spare time with the ladies. Occasionally we need to break the mould and get out for a bit of fun by ourselves. Bearing this in mind and wishing to honour my promise of a whisky tasting afternoon with a few good mates, I duly invited them home last week, to a little get together. We got together yesterday. These lads are not for beginners. Good friends, grown men in their fifties-plus, pipe smokers to a man and well versed in the bending of the elbow in the quest for the match of whisky to tobacco. We sat down to a sumptuous lunch consisting of the world famous Danish open sandwiches washed down with beer and snaps. Conversation was light, witty and good and punctuated only by short silences as we either ate or lit up a bowl. A good deal of laughter and the usual poking of fun made for a great repast. Finally we got down to the nitty-gritty. I have 20 varieties of single malt. The idea was to try them all. Minimal amounts in small glasses, water for dilution and pens and paper for notes. As the day progressed we were getting quite well practiced at finding the various hidden qualities and hints of flavouring, peatiness, caramel, fruit, and even flowers were discussed. Inevitably, one can’t drink all that scotch and get away with it unscathed. By the time my good lady got home from work we were as much in high spirits as we were full of them. We giggled, laughed, drank a bit more and finally reduced the judgement to either OK, not bad, bloody marvellous or let’s-have-another. Finally, after a wonderful ten hours of male bonding, wives began to turn up to claim their menfolk. Which was probably a good thing because if they hadn’t, none of us would have gotten home apart from me, as I was at least, under my own roof. My living room has a wonderful atmosphere today. The lingering scent of latakia tobacco, a hint of whisky and beer and a good deal of comradeship seem have permeated into the woodwork. This was definitely one of those good things. There was cause for celebration today in the shack, known as home, to me. I have been in this country for 25 years today. I have no idea where those years went. They have raced by. As things go, I am doing OK. The past 25 years have been more good to me than they have been bad. There have been more ups than downs. I’m happy here. I had planned to have some sort of celebration but all that went overboard a month or so ago when I found out that the date collided with the Danish Championship for slow pipe smoking. Not wishing to miss the annual cough and choke competition, I have deferred to the athletic pursuit of tobacco smoking and will invite my buddies to a whisky tasting afternoon at the shack next weekend. Which should be fun, if not extremely expensive. The pipe smoking was fun too. I didn’t win. I never will. I haven’t got the knack of getting three grams of tobacco to burn for over two and a half hours, so I don’t really have a chance. But just being part of the madness is great fun and one gets to see old friends and, perhaps, find some new ones too. The exhibition is a sight to behold too. Pipemakers displaying their handiwork, pipe restorers selling vintage and estate pipes and so on. I found another little pearl today. 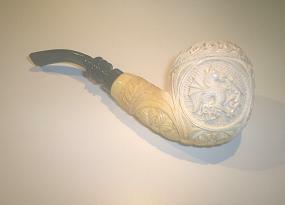 A 12 year old Peterson meerschaum “Gold Supreme” with silver mount. Hardly smoked and in beautiful condition, complete with original pouch, box and papers. 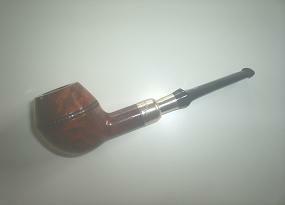 I think it is of African meerschaum, not Turkish. The highlight of my day was one of the pipemakers who saw my selection of pipes for the day in my pipe satchel. He examined them and congratulated me on their condition and the care that I have given them. Praise indeed, from one of the outstanding Danish pipemakers. All in all then, not a bad day. If I was going to have a party then I couldn’t have done it better myself. A whole day surrounded by friends, beer, hot snacks and a celebration of one of my favourite hobbies. Now I’m going to sit back and relax for the evening with a huge single malt, my “new” pipe, some good tobacco, my armchair with my feet up by the stove and whatever the talking box can serve up for my enjoyment. Some days life is just good. There should be more of ’em! I’ve been experimenting with my camera. Having tried to take photo’s of some of my more expensive pipes, as much for insurance reasons as for bragging purposes, I didn’t get much of a result before. Having read the handbook that followed the camera, I have found out how to take “macro” shots. So here’s my Peterson 2002 Limited edition. A beauty, ain’t she? And the picture isn’t too bad either. Having the picture here, on the internet, means that even if the computer breaks down, I can still show the picture to anyone with internet access. Which is great if I loose the pipe or it gets stolen. Maybe I should catalogue all my pipes like this? At least the expensive ones. Here’s another one. My meershaum by Sevket Gezer, Turkey, signed and beautifully carved it is known as the “Two Dragons” because of the twin dragons carved on either side of the pipe. After four years it is starting to “take colour” on the shank. The great thing about these meerschaums is, that even though the patterns are copied, no two are alike. Sevket is known for his floral decoration on pipes and this one is no exception. A few points about meerschaum. It is a porous material. Don’t get meerschaum pipes wet. Don’t smoke them with dirty hands. They will take sweat and dry out, but dirty sweat will leave a fingerprint on the pipe that will never come out. Wash your hands before filling the bowl and lighting up. It is not as fragile a material as one is led to believe. Other than that, they are wonderful to smoke.